Drain the chickpeas and add to a frying pan with the tinned tomatoes and chilli. Give a good stir and leave to simmer. Wash and debeard your mussels ('beards' are the thin tendril like bits, grasp between thumb and finger and pull downwards towards the hinged part of the shell). Remove any cracked or open mussels. Place the rest into a large pan with a splash of water. Cover with a lid, and cook on a high heat for 5 minutes. The mussels should now be open, remove any closed ones. Reserve a few mussels for decoration. 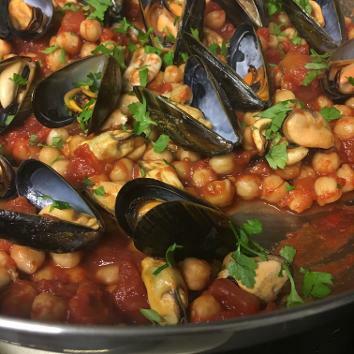 Remove the rest of the mussels from their shells and stir through the chickpeas and tomatoes. Place the ones on for decoration, sprinkle with parsley and serve.